2018 White Sands Balloon Invitational kicks off with a Pilot Reception on Friday evening, September 14. This reception is for the pilots, sponsors and crew. 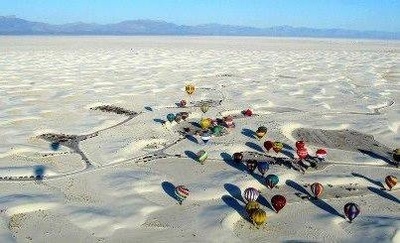 Saturday, September 15 - Balloons will launch from the beautiful White Sands National Monument. Gates to the park will open at 6:00 AM. Park fees will apply. No vendors will be at White Sands. Expected launch time 7-7:30 AM. Saturday evening - Balloon Glow at Ed Brabson Balloon Park. Vendors on site. Sunday, September 16 - Balloons launch from Ed Brabson Balloon Park 7-7:30 AM. Vendors on site. This is a free event; however, White Sands National Monument park fees will apply when you enter. Please note, this is not a Chamber of Commerce event. Please contact Ed Brabson at mande@totacc.com with any questions.